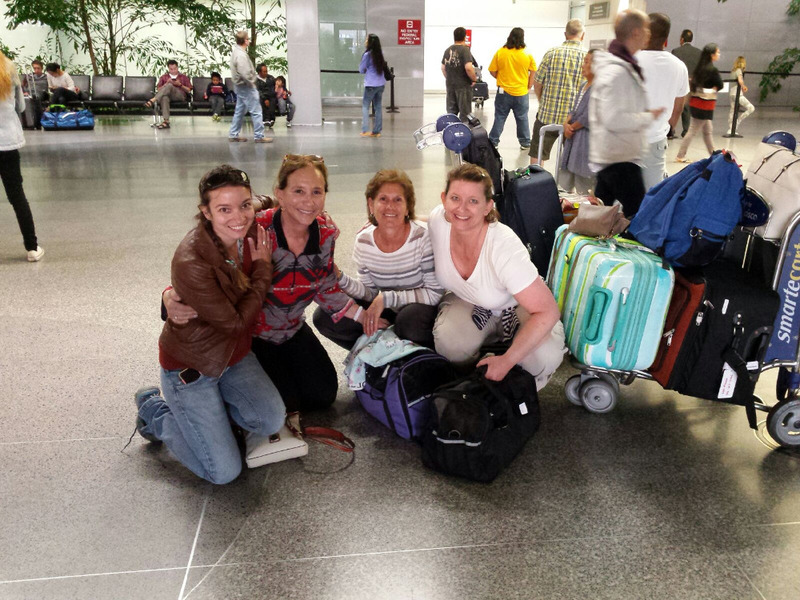 Marin Friends of Ferals (MFF) will be traveling to Mykonos, Greece, at the end of May to begin a TNR program (Trap-Neuter-Return) to help end the suffering of hundreds of animals, including feral and domestic cats abandoned on the island. We're fortunate In Marin County to have the resources to spay/neuter our community cats and provide for their ongoing care. But in Mykonos it's a different story. Greece's economic crisis is worsening, impacting everyone, including animals. Because family incomes have been cut, fewer resources mean many residents can no longer care for their pets. As a result, animals are being abandoned to fend for themselves. MFF plans to bring a local veterinarian and 2 volunteers to help conduct a mass week-long spay/neuter program. A vet on the island offered use of his clinic and our contacts living there will help collect the animals (both dogs and cats) for sterilization. WE ARE TAKING THE FIRST STEP TOWARD A BETTER, HUMANE LIFE FOR THE ANIMALS OF MYKONOS. MFF will provide ongoing support for spay/neuter costs and continued supplies of urgently needed pet food for residents feeding forgotten felines and abandoned dogs dependent on them for survival. WE BELIEVE ALL CREATURES DESERVE A LIFE FREE FROM SUFFERING. Granted, the situation for animals in Mykonos is daunting and we're only a small nonprofit. But that shouldn't (and won't) prevent us from trying to make a positive impact on the lives of these animals that desperately need help. We've raised over half the amount we need for this lifesaving mission but now we could use your help in our remaining weeks of fundraising. As the saying goes, "The journey of a thousand miles begins with a single step." MFF is ready to begin that journey in Mykonos. Will you help us take that first step? 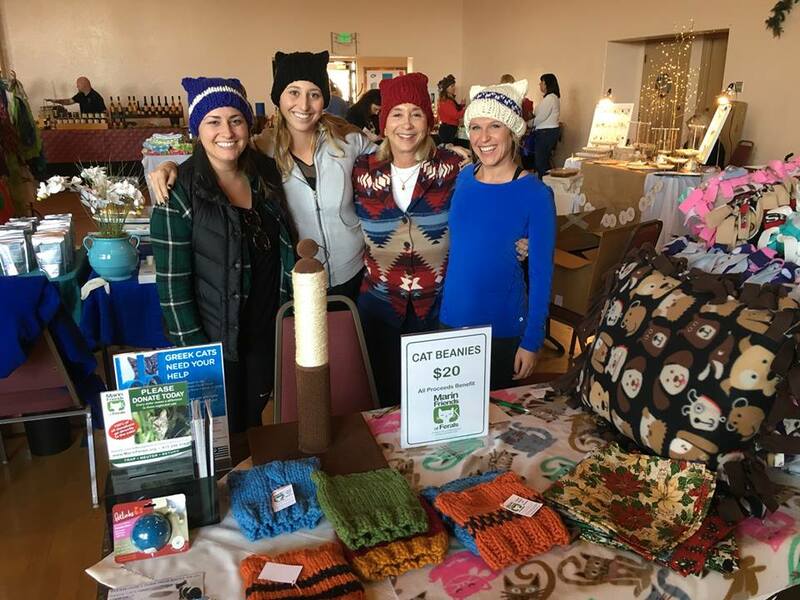 Marin Friends of Ferals is a non-profit, tax exempt 501 (C)(3) volunteer organization dedicated to the humane care and management of feral community cats. We are located in Marin County, California, north of San Francisco. For more information, please visit our website marinferals.org. 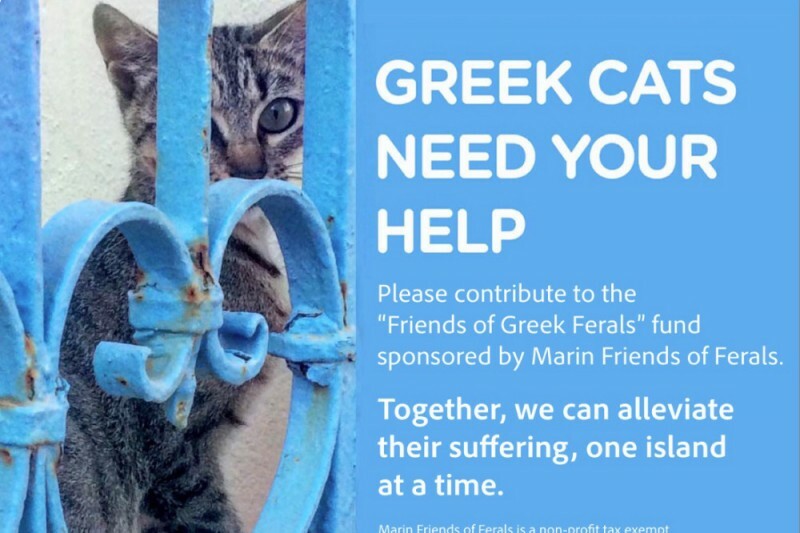 We at Marin Friends of Ferals would like to thank you for your donation toward our Greek Cat Project. Your funds definitely helped us make a positive impact for 89 cats on Mykonos. Of those, 79 were spayed/neutered and released back to their feeders. Seven kittens were rescued for fostering and eventual adoption, some to a rescue from Switzerland. In addition, three adults were saved from life on the streets and are scheduled for adoption. Two of them we brought back with us. They both have a broken leg and one will need an amputation. The other has a rod in his leg that needs to be removed soon but then they will both be adopted together. We also established an ongoing feeding program there, one of our main goals. We will be sending monthly donations to the head of Mykonos Animal Welfare, who will then distribute food to those who feed colonies on a very limited budget. So we feel good about being able to help in that respect as well. We hope to return in March or April of 2017 to continue where we left off. Without you, we would not have been able to embark on this mission at all. So thank you for your support in our quest for humane care and treatment of animals on Mykonos. 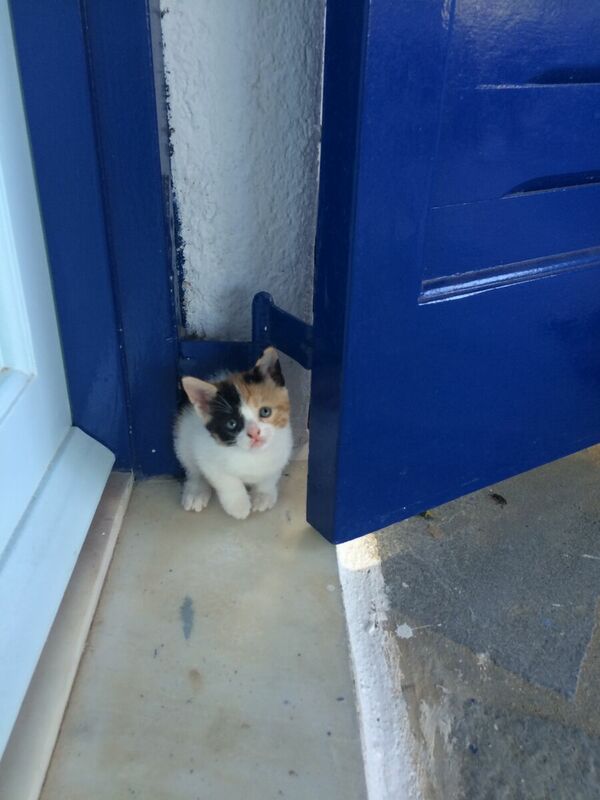 Just one of hundreds of street cats needing help in Mykonos. 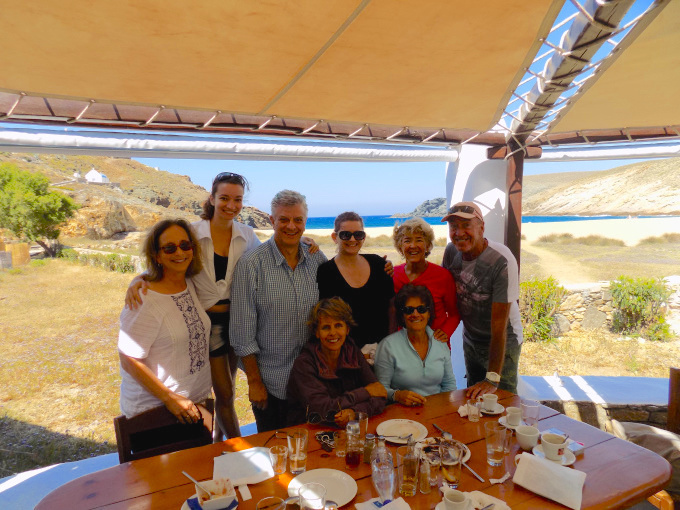 Our Greek friend, Pat (3rd from left), will be joining us in Greece. Here she is with our supporters at a recent fundraising event. From Bill and the GRPAA crew. Good luck and thanks for helping those helpless animals. Thank you for all your efforts for these cats. It sounds like an amazing adventure. I hope you help many kitties!